This introduction describes the official story, in the case of the World Trade Center as researched by NIST, and contrasts it with the scientific findings of independent researchers. The South Tower (WTC2) destruction looks like a violent explosion. To read the newspapers or listen to the radio, one would think that questions about the official account of events of September 11, 2001 come only from a fringe group. But this is an illusion, consciously propagated, we believe, by government agents and their mouthpieces in the mainstream press. In a series of public opinion polls, roughly half of Americans were shown to doubt that the government is telling us the truth about 9/11, and the numbers are growing each year. The truth is that among independent scientists with no axe to grind, a large proportion of those who look into the 9/11 evidence find grounds for doubt. A few have put their reputations and careers at risk in order to speak out about that evidence, and what they see. In 2010, larger numbers of scientists have joined together and contributed their expertise to create this web site. It doesn’t take a PhD to understand that the official account of the 9/11 attacks contains contradictions and physical impossibilities. One of the strongest reasons for doubting the official version is common sense. Still, sometimes our common sense can fool us, and, especially where such serious charges are being levelled, it is wise to consult scientific expertise as well. One good place to begin is this video of the North Tower of the World Trade Center (WTC1). Does it look like a building collapsing under its own weight? Or does it look like a descending series of explosions, progressing at about the same rate as the falling debris? Jet planes are fueled with kerosene, which is not a high explosive and cannot sever steel or pulverize concrete. Scientists for 9/11 Truth asks you to read and consider the evidence we present here. We ask you to present the arguments to an independent scientist of your acquaintance, someone whom you know and trust. Write back to us, please! Tell us what you think, and what you have heard from scientists whom you personally know and trust. But in the case of 9/11, there are hundreds of insiders who have come out to tell their piece of the story, sometimes at great personal cost. Some of these are police, firefighters, and first–responders. Some are 9/11 survivors, and the family members of those who died in the Twin Towers. Both chairmen of the official 9/11 Commission have written to warn us that key questions were not answered in the 9/11 hearings, that they were not allowed to question witnesses, and that their conclusions were tainted. Much of the testimony by Khalid Sheikh Mohammed, accused of master-minding 9/11, was obtained through torture. The Commission was a governmental body whose chairman, Thomas Kean, was appointed by President George W. Bush; the other members were appointed by Congress; and the executive director, Philip Zelikow, was essentially a member of the Bush White House. Former New York Times writer Philip Shenon points out in his book, “The Commission,” that Zelikow had secretly written a detailed outline of the Commission’s report before his research staff had even begun its work. The encylopedic evidence that refutes the official account of the events of September 11th is freely available in photos, videos, and government reports. Scientists for 9/11 Truth presents some of this evidence on its website, and is calling for an open debate. Buildings at the World Trade Center, New York City, are designated as WTC1, WTC2, and so on. WTC1 and WTC2 (the Twin Towers) are each 110 stories high, while WTC7 (Building 7) is 47 stories high. There is no evidence that the alleged hijackers were on board any of the four flights. The distribution of the crash debris at Shanksville suggests that Flight 93 blew up or was shot down rather than crashing at the designated site. Most of the WTC1 and WTC2 steel, and all of the WTC7 steel, except one or two pieces, was hurriedly sold as scrap without examination. NIST mostly used computer modeling for the behavior of the WTC buildings and ignored all contradictory physical evidence. There is a multitude of evidence that refutes the official story. September 11, 2001: Two planes crash into the World Trade Center. 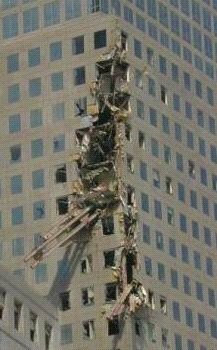 Three major buildings (WTC1, WTC2 [the Twin Towers], and WTC7) are completely destroyed, and others are severely damaged. May, 2002: FEMA (Federal Emergency Management Agency) issues its final report, finding high temperature corrosion and sulfidation of steel in the Towers and WTC7. The report stated that the best explanation of the collapse, namely fire, had a low probability of being correct. See Appendix C (Limited Metallurgical Examination) of the FEMA World Trade Center Building Performance Study. May 30, 2002: Cleanup efforts end (after 261 days, 24 hrs/day). All debris is removed. Despite objections, very little of the debris is examined to determine the cause of the building collapses. November 27, 2002: Congress and the President create the 9/11 Commission after 442 days of agitation by 9/11 victims’ family members. The Commission is headed by Thomas H. Kean (Chair) and Lee H. Hamilton (Vice Chair). The Executive Director is Philip Zelikow, an indiviual with strong ties to the Bush Administration. a large number of omissions and distortions – and no forensic examination whatsoever. no mention of the complete destruction of WTC7 (47 stories high). September, 2005: After an investigation consisting mainly of computer simulations, NIST releases its final report on WTC1 and WTC2. August 26, 2008: In a public session on NIST’s WTC7 preliminary report, a high school physics teacher, David Chandler, challenges NIST’s assertion that free fall had not occurred. Chandler shows that for the first 105 feet, WTC7 was in fact in free fall. In its final report, NIST acknowledges this fact, but continues to deny that explosives were used. November, 2008: NIST releases its final report on WTC7. Thermal expansion of steel from fires caused the “collapse.” NIST’s study of WTC7 was almost entirely computer simulated. From the start, many individuals world–wide questioned the official story of 9/11 that was promulgated within 48 hours of the events themselves. Newscasters on 9/11/01 gave their impressions freely, likening the World Trade Center building collapses to known instances where explosives were used to knock a building down. Within 48 hours the candid observations of newscasters ceased. While the Tower destructions were shown over and over again on mainstream television channels, the fall of WTC7 was shown but once, and rarely thereafter. It was, and still is, a source of amazement to most people that the US government, having ostensibly failed to prevent the “attacks,” was nevertheless able, within the space of a day or two, to name most of the so-called “hijackers” of the four airplanes. The names provided indicated a Middle Eastern origin. Discrepancies in the official story appeared almost immediately. The flight lists released by the airlines involved contained no passengers with Middle Eastern names. As the events were studied, more and more questions arose, particularly about the speed and nature of the Twin Towers’ “collapses.” In a feat of apparent scholarship within two days of the events, Zdenek Bazant and Yong Zhou published a theoretical paper purporting to show how the Towers’ collapse could have occurred from the damage caused by the airplane impacts and the ensuing fires. Subsequently, other scholars and scientists put forward substantial criticisms of this paper. From these beginnings, a world–wide movement, now known as the 9/11 Truth Movement, has emerged. The evidence for the central conclusion of the 9/11 Truth Movement — that the official story is false — has been created by thousands of individuals who care deeply about the truth. This movement includes citizens from all walks of life in most countries of the world. Many professional organizations have grown up, as can be seen through an internet search based on the words “for 9/11 Truth.” Independent research is on-going in many different areas. 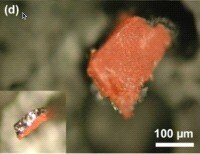 One of the more significant discoveries by independent scientists is that of red-gray chips containing unreacted nano-thermite in the WTC dust. 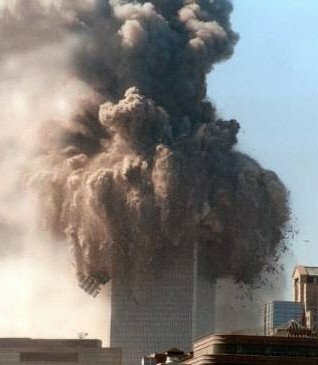 March, 2009: A team of nine international scientists announces that WTC dust samples contain unreacted nano–thermite. (The by–products of the thermite reaction, iron–rich microspheres, were discovered earlier by several different investigators). In the remainder of this Introduction to the Science of 9/11, we focus almost exclusively on the World Trade Center. We hope eventually to have material on other features of 9/11, including the Pentagon and the event at Shanksville, Pa. The Twin Towers were completed in the early 1970s. The North Tower was 1368 ft (417 m) high, with a communications antenna (360 ft) (110 m) high. The South Tower was 1377 ft (420 m) high. Each tower had 110 stories. The floors were 208 ft x 208 ft (1 acre) (40,000 sq. ft) (3,700 sq. m) in size. The 87 ft x 135 ft inner core area housed elevator shafts, rest rooms, and stairwells. Each tower had 236 outer steel columns (aluminum clad), 47 massive steel core columns, and 96,000 tons of steel per tower. The floors consisted of 4 inches of lightweight concrete on fluted steel decking, on trusses. The concrete in the floors in each tower (excluding the basements’ concrete) weighed about 90,000 metric tons, with 49,048 cubic yards (normal) or 67, 267 cubic yards (lightweight) of concrete per tower. WTC Towers Floor Plan showing the core area and truss layout. Additional trusses spanned the entire width of the building, and also ran parallel to the core short sides. This figure shows a cross–section of a smaller core column of the WTC towers, about halfway up. At the base of the building, the steel was 5 inches thick, and core columns were 54 inches x 22 inches. At the top, the core columns were ¼ inch thick. WTC Towers Spandrel Plates and Floor Trusses. 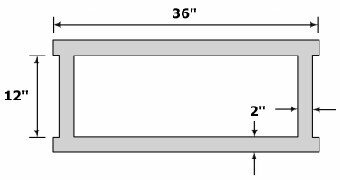 This figure shows the perimeter column/spandrel assembly and floor structure. The perimeter columns were connected in groups of three, three stories high, using spandrel plates. The perimeter columns were square, 14 inches on a side. Note the floor trusses and steel fluted floor decking. Knuckles/straps handle shear transfer. WTC North Tower During Construction. This figure shows the 236 outer steel columns (aluminum clad), and 47 massive steel core columns. NIST’s Final Report on WTC1 and WTC2 was published in September, 2005. Response of the structure, and failures leading to initiation of collapse. Steel loses 50% strength at 650° C and melts at 1480° C.
The jet fuel fires burned out after 10 to 15 minutes. The fires were oxygen–starved (black smoke). Under the best conditions, jet fuel (kerosene) fires would not reach above 1000° C. WTC1 and WTC2 fires were probably no hotter than 650 to 700° C (MIT professor Thomas Eagar). Evidence shows the fires were probably much less hot. NIST did a shotgun test to see if fireproofing could have been dislodged. Result: No, too much energy needed. Recovered core columns did not experience temperatures greater than 250° C.
There was no evidence any steel samples reached temperatures above 600° C.
Tests showed floors sagged less than 4 inches (but 42 inches were used by NIST in its model). Despite the NFPA 921 standard, NIST never tested for explosives. Why minimal resistance? This is an observation that requires explanation. NIST needs a calculation. Independent calculations show this is not true (Hoffman). Another observation. But where is the explanation? This does not explain the ejection of tons of steel beams laterally for hundreds of feet. NIST ignored all eye–witness accounts of explosions, the molten steel, corroded steel with sulfidation, and never tested the dust for explosive residue or its by–products. The walls buckled, and global collapse ensued. Never before or since September 11, 2001, has a steel–framed building collapsed from the effects of fire. NIST’s models depend on stripping of insulation and fire temperatures of 1000° C.
The towers were built to withstand the impact of a Boeing 707 traveling at 600 mph. The Boeing 767s, though 20% larger, were traveling more slowly (400 and 540 mph) and would have been less destructive. Little dust, fire smoke only. 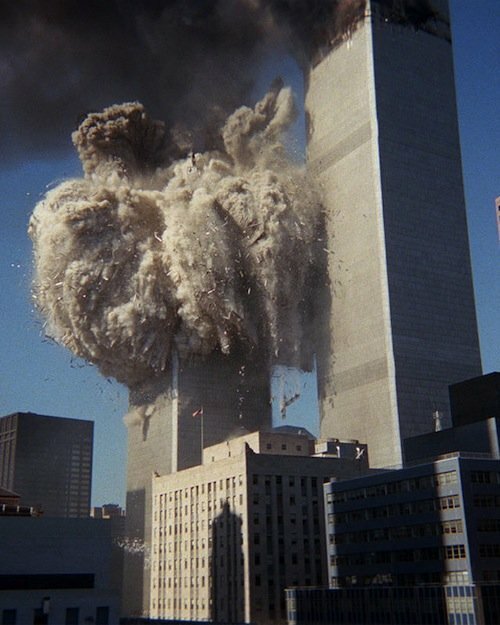 NIST ‘s investigation ended before the actual “collapses” began and ignored the many independent pieces of evidence that point to controlled demolition. Most indicators of the controlled demolition of a structure appear after collapse begins.This evidence is discussed in the following sections. Steel is a good conductor of heat, and quickly transmits heat to other, cooler portions of the steel structure. 1988: First Interstate Bank Building in Los Angeles. Fires raged for 3.5 hours and gutted 5 of this building’s 62 floors, but there was no significant structural damage (FEMA, 1988). 1991: Philadelphia’s One Meridian Plaza. Huge fire lasted for 18 hours and gutted 8 of the building’s 38 floors, but, said the FEMA report, although “[b]eams and girders sagged and twisted . . . under severe fire exposures. . . , the columns continued to support their loads without obvious damage” (FEMA, 1991). 2004: Caracas, 50–story building. Fire raged for 17 hours, completely gutting the building’s top 20 floors, and yet it did not collapse (Nieto, 2004). These fires, unlike the Towers’ fires, were hot enough to break windows. The Towers’ fires lasted for only 56 (WTC2) and 101 (WTC1) minutes. 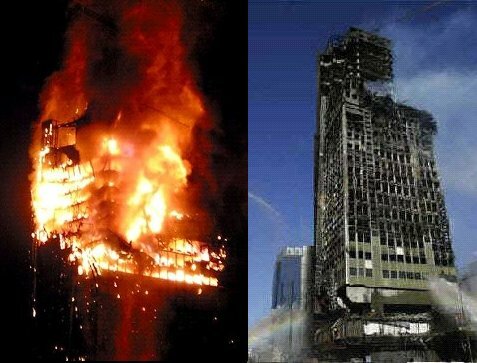 2005: The Windsor building in Madrid, a 32–storey, steel–reinforced concrete building, burned for almost 24 hours, completely engulfing the upper 10 stories. Windsor building fire in Madrid before and after a fire, February, 2005. The construction was steel–reinforced concrete. Concrete, a poor conductor of heat, is much more susceptible to fire damage than steel. Result: Six upper floors partially collapsed. WTC Debris Fields. Schematic depiction of areas of collapse debris impact, based on aerial photographs and documented damage (FEMA, 2002). 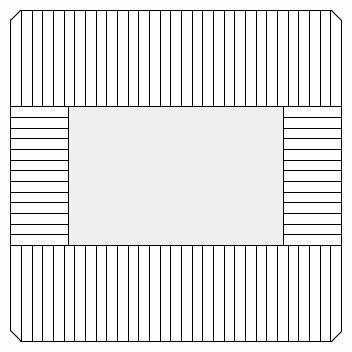 Striped areas indicate predominant locations of exterior steel columns. 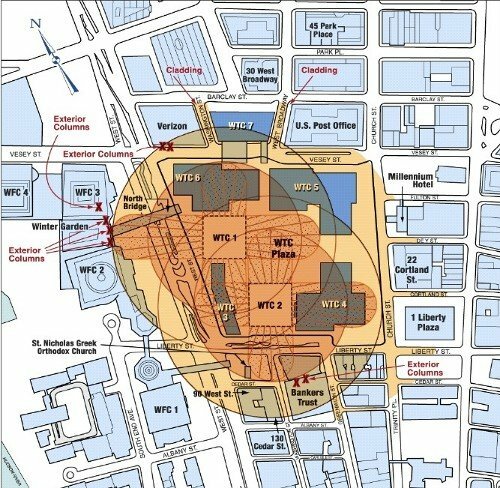 Inner circles indicate approximate radius of exterior steel columns and other heavy debris. Outer circles indicate approximate radius of aluminum cladding and other lighter debris. Heavy Xs show where exterior steel columns were found outside the predominant debris areas. The Towers were 208 ft x 208 ft (floor area). Small debris circle diameter = 735 ft. Large debris circle diameter = 1080 ft.
North Tower “Collapse” at Start. The North Tower is consumed in a vast eruption as would be produced by a choreographed cascade of thousands of small blasts. In August, 2005, the City of New York was forced by court order to release 503 oral histories recorded by the Fire Department of New York (FDNY). In these histories, 118 witnesses recounted the occurence of explosions or phenomena suggestive of explosions. Prior to collapse, the roof line of WTC1 was motionless. It then suddenly started to move downward with an acceleration of 0.64g (g = acceleration of freely falling body due to gravity). In a real collapse under gravity, the collapse starts slowly as the structure deforms and proceeds in an irregular fashion. The Towers were reduced to rubble a few stories high, short steel lengths, and mainly dust. 60% of the material fell within the building’s footprint, 40% fell outside. There were no pancaked floors. Impaled Steel Columns Steel columns impaled in floor 20 of the World Financial Center building 3 (WFC3) hundreds of feet from the Towers. This term has been appropriated to describe the physical appearance of puffs or jets of dust emerging from buildings during a demolition. 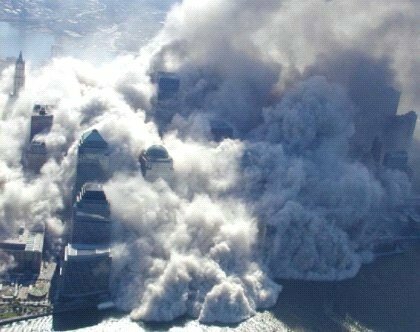 Rebuttal: The squibs seen coming from the Towers contain thick dust, there are no pancaking floors, and squibs are observed in distinct patterns 40 stories below the floor where destruction is currently occurring. Outer steel columns and aluminum cladding were flung hundreds of feet (see Ejection of Steel Beams and Aluminum Cladding). Bone fragments were found on the roofs of nearby buildings. 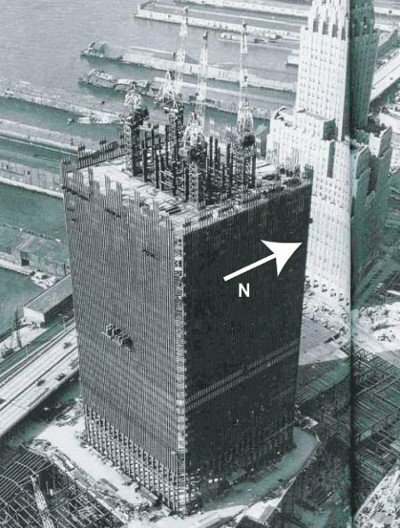 In 2005/2006, 750 bone fragments were found on top of the Deutsche Bank Building (41 stories high, about 200 feet south of WTC2) (see Pulverization). For another map showing the location of debris that fell on the Winter Garden, see this diagram. Note: To determine the scale, use 208 feet for each side of the Twin Towers. Assistant Commissioner Stephen Gregory, Captain Karin Deshore, and Firefighter Richard Banaciski (from 9/11 Oral histories) described demolition rings. Near free-fall acceleration defies the laws of conservation of momentum and energy. If the floors above hit floors below, momentum must be conserved, so that the time of collapse would be greater than that observed (10 – 14 seconds). When resistance by the undamaged floors is taken into account, the collapse time should be much greater than the observed time. Pulverization cannot occur at the same time as near free fall. The energy used to pulverize materials will slow down the collapse. The pile driver theory is absurd (see Pile Driver Theory Refuted). There was no evidence of pancaking floors. No steel floor decking or large concrete pieces were found. There was early pulverization of materials at low “collapse” speeds. How could this happen? Many steel columns were cut into lengths convenient for hauling away. Controlled demolitions typically arrange for this to happen. A pyroclastic flow typically hugs the ground as it rapidly propagates. Dust clouds were created far above the impact zones. North Tower “Collapse” – Within one minute of the North Tower’s collapse, the mammoth cloud of thick dust engulfed most of the southern end of Manhattan. Dr. Abolhassan Astaneh–Asl, Professor of Civil and Environmental engineering, University of California, Berkeley, found evidence of unusual warping and melting of girders, and steel flanges that were reduced from 1 inch thick to paper thin. Worcester Polytechnic Institute researchers found severe high–temperature corrosion with sulfidation. Leslie Robertson (the engineer who helped design the towers) found fires still burning, and molten steel running 21 days after the event. metallic lead was caused to volatilize, oxidize, and finally condense on the surface of mineral wool – the temperature to volatilize/boil lead is 1,740° C (RJ Lee Group, 2004) (see Extremely High Temperatures at WTC Site). Unusual spikes in volatile organic chemical (VOC) emissions suggested abrupt, violent fires on specific dates. Unusually high amounts of sulfur, silicon, aluminum, copper, nickel, iron, barium, and vanadium were detected. Anomalous amounts of 1,3–DPP (1,3–diphenylpropane) were detected. The above observations are best explained by the physical release of materials from energetic nano–composites. “Several inches of dust covered the entire area after the destruction of the WTC buildings. Millions of gallons of water were sprayed onto the debris pile. The WTC fires are difficult to explain as a normal structure fire, even one involving jet fuel. These fires are better explained by the presence of chemical energetic materials, which provide their own fuel and oxidant and are not deterred by water, dust, or chemical suppressants. But how did such materials come to be in the WTC dust? WTC dust contains a large amount of iron–rich microspheres, unexplained by RJ Lee and the United States Geological Survey (USGS). Extremely high temperatures plus a violent physical disturbance are needed to form 1.5 mm to one micron diameter iron spherules through surface tension. The WTC dust has a very high “mean composition” of “Fe (iron) spheres” of 5.87% (only 0.04% in ordinary building dust). Unexploded nano–thermite (Harrit et al., Open Chemical Physics Journal 2009). Fourth sample a week later. Samples were analyzed using optical microscopy, scanning electron microscopy (SEM), X–ray energy dispersive spectroscopy (XEDS), and differential scanning calorimetry (DSC). Red material contains grains approximately 100 nm across which are largely iron oxide, while aluminum is contained in tiny plate–like structures. The iron oxide and aluminum are intimately mixed. When ignited, there is large narrow exotherm (energy output) at 430 °C, far below the normal ignition temperature for conventional thermite. Numerous iron–rich microspheres are clearly observed in the residue. The red portion of these chips is an unreacted thermitic material and highly energetic (see Red/Gray Chips). The scientific method considers ALL the observations, data, results of experiments, and so on, and seeks the theory that addresses and explains all or most of the relevant data. Which of the Above Theories is Outrageous? This 15 minute video is an excellent introduction to the science of the destruction of WTC7. It is narrated by well-known actor Ed Asner, and features many of our members. FEMA is not an investigative agency. FEMA assembled a volunteer team of engineers from ASCE (American Society of Civil Engineers). The engineers were not granted access to the site. The team only picked through metal pieces that arrived at the Fresh Kills Landfill. The WTC7 steel was rapidly removed and mostly sold overseas. The FEMA Final Report was issued on May, 2002 (just after all WTC debris was finally removed). Worcester Polytechnic professors examined one piece of WTC7 steel and found high temperature corrosion of the steel with sulfidation. The FEMA Report was completely indecisive. NIST took over the investigation after FEMA (October 2002). NIST ruled out the possibility of explosives in a hypothetical argument based on the loudness of RDX and C4 explosives. NIST never examined the dust for explosives. For some years NIST suggested debris–induced damage and long–burning fires fed by diesel fuel caused the destruction (the explanation favored by Popular Mechanics). In its final report, NIST ruled out these causes in favor of a theory based on the thermal expansion of steel girders. Shyam Sunder said free fall could not occur because of resistance by the structure itself. David Chandler showed free fall did occur for a distance of about 105 feet, or a time of about 2.5 seconds. NIST admitted to free fall in the final report, but did not examine the implications. This failure led to a sequence in which the entire building collapsed. NIST’s WTC7 Plan view of regions for collapse initiation. 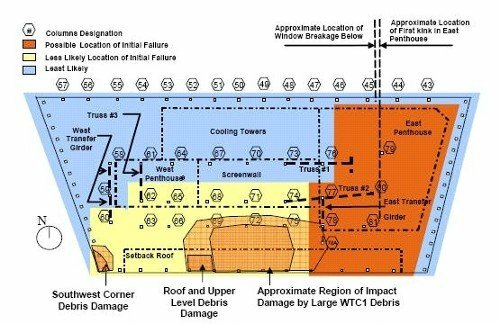 The diagram reflects NIST’s theory of the “collapse.” According to NIST, there was some damage from falling debris from WTC1 that started some small fires. This caused an unprecedented “collapse” of a steel–framed building. “Collapse” occurred at 5:20 pm on 9/11, after many warnings. There are many problems with NIST’s theory that suggest fraud. See David Ray Griffin’s “The Mysterious Collapse of World Trade Center 7,” Olive Branch Press, 2010. NIST’s Theory for WTC7 is almost pure speculation. There is no direct evidence for high temperature fires, expansion of girders, or failure of columns due to fire. Evidence of corroded steel with sulfur found by FEMA. Sulfur is a component of a thermate reaction that can be used in controlled demolitions. The testimony of Barry Jennings, who was trapped in the building with Michael Hess by an explosion before either tower fell. Video–taped statement of a witness who overheard a “count–down” for WTC7. Videos showing the actual collapse of WTC7, with various evidences of controlled demolition such as a kink in the roof, possible exploding charges at upper stories, and so on. Audible explosions heard by eye–witnesses just before and during the collapse of WTC7. The BBC and CNN early announcements of the complete collapse of WTC7 have never been satisfactorily explained. Removal and destruction of WTC7 steel before examination. Real examination of the steel was denied to all. Omission from the 9/11 Commission Report of any mention of WTC7. The complete collapse of a 47–story building is not trivial. NIST’s failure to seriously consider other causes besides fire for the building collapses strongly suggests government interference in a scientific process, and points to a selective and thereby fraudulent investigation. The standards for fire investigations call for tests for explosives. No such tests were made. 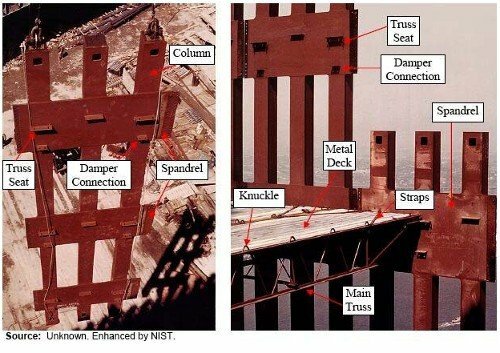 NIST postulated the least likely explanation for the destruction of WTC7, and ignored all other physical and other evidence. NIST’s assumptions or inputs used in its computer modeling are open to severe criticism. Also, the details of the modeling program are not available for independent review. NIST’s theory and approach lack scientific credibility. How Credible is NIST Scientifically? NIST is an agency of the United States Department of Commerce. As can be seen, NIST completely avoids the question. It was the “collapse” mechanism that produced the molten steel! In the NIST (November 2008) Final report on WTC7, NIST conceded a period of free fall. They recognized three stages: (1) a period of slow descent (2) a period of free fall – 105 feet for 2.25 seconds (3) a period of decreasing acceleration. Total time 5.4 seconds for 17 floors to disappear from view. There is now no mention anywhere of this being “consistent with physical principles.” NIST admits free fall occurred, but never addresses the physical implications of free fall! Even though National Fire Protection Agency guidelines (NFPA 921) require that, in the case of “high–order” damage, tests be made for explosives, NIST made no such tests. Newman’s response is completely at odds with the NFPA guidelines, as well as with the scientific method. There is something there! – unexploded nanothermite and the by–products of a thermite reaction – iron–rich microspheres!